Iâ€™ve been reviewing several Big Muffs lately and they all offer something different – some more convincing than others. The new hype seems to be pedals loaded with new features and it may be hard to find a straight clone of the old classics. 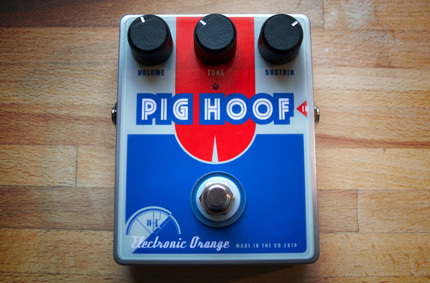 The Pig Hoof from Electronic Orange promise to be a faithful clone of the â€œramâ€™s headâ€ Big Muff â€“ hereâ€™s my review. But what is exactly is a â€œramâ€™s headâ€? What makes it different from the â€œtriangleâ€? Not much. The fact is that the so called â€œtriangleâ€ and â€œramâ€™s headâ€ circuits are more or less identical although the box designs and graphics are different â€“ hence the triangle positioned knobs on the first Big Muffs and the straight positioned knobs with the ram face logo on the second generation pedals. That being said due to inconsistent use of parts during the first years of production some pedals might sound completely different to each other. A â€œtriangleâ€ may sound like any other â€œramâ€™s headâ€ and vice versa. The schematic on the paper didnâ€™t always fit the actual layout of the specific pedal. This and the fact that parts value change over time means that an original 1973 Big Muff wonâ€™t sound the same today as it did new. So, a clone will never fully represent the original but rather a version based on carefully selected similar sounding pedals or the â€œideaâ€ of how the original sounded like. Over time clones have defined the differences and thatâ€™s why we in general can say that a â€œtriangleâ€ has a dark, smooth tone and the â€œramâ€™s headâ€ has more gain and an overall more aggressive brighter tone. See Kit Raeâ€™s excellent Big Muff site for more details on each version. But all of this doesnâ€™t really matter. You should be aware but what really matters is whether you like the pedal or not. As long as the pedal feature reasonably good quality parts and the assembly is up to standards I dare to state that thereâ€™s no such thing as a bad pedal. Only different tastes. About a year ago I did a review of the Electronic Orange Moon Vibe, a clone of the original late 60s UniVibe. I was immensely impressed and was keen on checking out some of their other pedals as well. The Pig Hoof is housed in a T-Rex sized box with true bypass switching and controls for gain, tone and volume. It has a bright led and runs on 9V battery or Boss style adapter. The tone is unmistakably â€œramâ€™s head-ishâ€ with saturated gain, thunderous well-balanced lows and a crisp top. The Pig Hoof is slightly darker than most â€œramâ€™s headsâ€ Iâ€™ve tried but IMO thatâ€™s just an advantage as these models tends to be just a bit too bright and harsh. It still manages to maintain the top frequencies though and a fat attack â€“ or the typical â€œclickâ€ you get from Muffs. I’m using a Fender CIJ ’65 reissue Stratocaster with EMG DG20 pickups into a Boss CS2 > EO Pig Hoof > ThroBak OD Boost > EHX Deluxe Electric Mistress > Boss RT20 and a Laney Cub12 15w stack. The second clip is recorded in mono and duplicated with a wide stereo spread with reverb and delay added in Logic. The Pig Hoof is very loud. One of the loudest Muffs Iâ€™ve had. Thatâ€™s usually a problem and pedals like the Pink Flesh is just too wild and hard to tame but the Hoof is remarkably responsive and dynamic to your playing and the guitar volume and it goes very well with a booster behind it. Itâ€™s also surprisingly quiet, something Iâ€™d never would expect from a pedal this loud. In terms of Davidâ€™s tones the Pig Hoof covers everything from Animals, DG78, Wall to PULSE and Gdansk. Its transparent mids scooped tone makes it ideal for using different sounding boosters to shape the tone. Add a Colorsound Power Boost for the late 70s tones and a Tube Driver for the more present tones or perhaps a slightly darker Tube Screamer or OCD for some really squeezed warm tones. The Hoof also stands well on its own. Add a Mistress and some delay and youâ€™re spot on Final Cut. I also recommend using the Hoof alone if youâ€™re mainly playing at home on smaller wattage amps. Itâ€™s not as bright and doesnâ€™t cut as much through the mix as the Blackout Effectors Musket but youâ€™ll have no problems getting killer tones with it â€“ itâ€™s perhaps a better choice compared to the Musket on bright Fenders and similar amps. Iâ€™m not really sure what to put my finger on. If youâ€™re a die-hard fan of the early Sovtek models you might find the Pig Hoof to be just a bit too mild although it has much more gain than the typical â€œtriangleâ€. If youâ€™ve blown your savings on a Cornish P1 you might find the Hoof a bit too wild and dark but then again you probably wouldnâ€™t care about another Big Muff. I urge everyone to check out the Pig Hoof and the rest of the vintage collection from Electronic Orange. They make some fine stuff! The Pig Hoof was tested on two different Stratocasters, one with Fender CS69+Duncan SSL5 (bridge) pickups and one with EMG DG20 pickups and two different amps, a Laney Cub12 15w stack and Reeves Custom 50w â€“ both with Weber Thames 80w speakers. Thanks for the tip – I am located in Prague and had just one hand built and hand delivered by the engineer himself: Jan Horinek :) Lovely piece of gear! … Tips on mixing it with a TS9, TC Electronic Spark, and possibly a ProCo RAT? The best way to boost it is with a transparent booster but one with a bit of gain. Try the Boss BD2 or Jan’s Bananaboost :) Don’t pair it with a second distortion like the RAT. You’ll only get tons of noise and feedback. I have a Jeff Beck signature Strat plugged into a Laney Lionheart 5w amp for a bedroom setup, and Buffalo FX Power Booster on the way. After reading all these comments, I’m thinking you’re going to recommend the Vick 73 Ram’s Head over the Orange Pig Hoof or BYOC Large Beaver. Am I right? What about the Buffalo Patriot–or anything else you can think of to help me get that Gilmour warm, sweet sustain? As I always say – depends on what tones you want :) The Pig Hoof is still my favourite Muff but the Lionheart goes perhaps better with a model with more mid range. The 73 is similar to the Pig Hoof, although smoother and with less low end and it has a mids boost. The Patriot is a very different sounding Muff, with more mids, more gain and an overall darker tone. I’d go for the 73 for David’s Animals-Final Cut tones and perhaps the present tones and the Patriot for the PULSE era. I have a Cub stack and Power Booster as well and I’m curious what your Pig Hoof settings would be for DSotM. Try setting the volume and gain to 60% and the tone to 40%. Hear how that sounds and make the needed adjustments. After lusting after a Pig Hoof for YEARS, my very own arrived by post today. Jan was very nice and a pleasure too work with. I plugged it in with only it and my Catalinbread Manx Loaghtan in the signal chain into my 68 Custom Princeton. I set all the knobs too noon. I was instantly surprised at how musical, warm, and familiar the fuzzy tone seemed. I say familiar, but at the same time, I felt like I was really hearing a big muff for the first time. It seemed to respond in just the way you expected it to, and hoped it would, when you used different playing dynamics. The “crispy top” as Bjorn describes it, is so pleasing, and also necessary for clarity amid all that thunderous muffy goodness. Same thing with the attack. The high end and the pronounced attach somehow keep the sound from being muddy, at least for leads. If you brighten up the tone a bit, you can chug along on rhythm with a nice rich distortion sound. I tried to set the Catalinbread to match it, and although I managed to get close, I ended up giving up and just playing the pig hoof, because it just sounded so rich and effortless to get a good tone. I barely moved the knobs from noon. With the CB it takes a good amount of tweaking to find your sound. It is versatile and a good sounding pedal, but the PH is really in a different league when it comes to a really bringing to light the most musical qualities of this legandary circuit. A skeptic might say, “well you paid a good chunk of money and waited four months for this thing…of course you’re going to make yourself like it!” And the truth is, I half expected to plug it in, and to like it, but to also say, “well, it”s really just another decent fuzz pedal.” Not this time. it was immediately clear that any extra ducats (with the current exchange rate this pedal’s price is totally competitive with any “boutique” muff clone to buyers in the US), and being on a waiting list was completely justified. If you’re on the fence about this one, believe me, you won’t be disappointed. Awesome, Brad! Thanks for sharing! At the time being, i am designing an 18V version of my Bananaboost. It will be fed from a standard 9V battery/power supply to bring some comfort to people who want to run it from a common power supply. The 9V will however double inside, giving the boosted signal the right headroom. Just fired up the prototype and it sounds more than pleasant. You nail that “Mother” solo. Well done, man. First of all. I really appreciate your website. You have obviously spent a lot of time on this and it’s extremely helpful. Which Muff do you think would be most suitable ? Pig Hoof or the Musket. I have the Caprid and love it but it isn’t an easy pedal to work with. If you are recording or have time to set up for a specific tone then the Caprid can sound great. But it lacks mid range and gain. A lot. At the moment I prefer the Vick or the EHX Big Muff Pi Deluxe as it is set it and forget pedals. Very easy to get good sounds from them. I’d like to have your opinion about Vick 73 vs Pig hoof. What i”m looking for is that true Gilmourish 73 Violet rams’ head tone ( his no 1 Muff, the no 2 Muff (replica), the cornish P1). Which one would you recommend…. It would be used on a Laney Cub head + Throbak overdriver or with Bk type pedals ( BD-2 or wampler plexidrive). I’ve had a long struggle to discover my own sound. But at the end I thought it would be better to follow Bjorn’s advices ! So…. The Buffalo Powerbooster arrived 1 month ago, the pighoof yesterday. I use it in combination with a HK Tubemeister 18 and a Kool&Elfring 2×12 cabinet. I have an USA strat and a Music Man Luke II. It sounds simply massive ! Even at lower volumes. So for now: very happy with the pig hoof ! So, if i rely on your advice about choosing the vick 73 over the pig hoof, could you please bjorn tell me what setting on the vick i have o use to sound like david’s rams head? I guess scooped setting…and will i be able to use it with the throbak overdriver or tube driver style pedal placed just after it as a booster? As i can use the 15 watt channel of the laney cub, is it still better to use the vick over the pig hoof? I’d like to share your experience about using the pig hoof on your laney cub head. Does it really work well with the amp? Can i use it with a clean booster ( powerboost or tube driver) with high quality results? If not will the vick in scooped mode be a great replacement for a rams head clone? And will it stack well with powerboost or tube driver? I currently have the Electro-Harmonix 2000 Big Muff PI reissue and I was thinking of buying a different distortion pedal as the one I own does not quite cut it when it comes to my tone or Gilmour’s stuff. I am very on board for ordering the Pig Hoof (Or the Mk II), however I have a policy of ‘try before you buy’. But I obviously can’t try the Pig Hoof as it appears to be order-only. Bearing in mind I appreciate the tone characteristics of the Big Muff already, is it worth ordering the Pig Hoof out of the blue without trying it? It arrived today! I’ve had a quick play through a few tunes with it and I’m pleased, it’s absolutely immense!! It sounds like a monster, huge sound and bags of sustain even at bedroom levels with my Cub12. I couldn’t be happier, I’m looking forward to having a play about with the settings a bit, but to be honest it sounded amazing with the settings borrowed from your review. Buffalo FX Power Booster next :-) I’m currently boosting it with my Soul Vibe, but I think it would be best to boost with the Power Booster and keep the Soul Vibe for a crunchy OD. The Soul Vibe is such a lovely sounding pedal. OMG!!! My Pig Hoof is on the way!! I ordered last November so I’m super-excited that the wait is over, and even more of a bonus is that I’m having the new design version. Massive thanks to Jan at Electronic Orange for keeping me up to date with progress of my pedal. Hurry up Mr Postman! Your site continues to rock, long may it continue. Hi guys, here is Jan from Electronic Orange. We have moved a step ahead and changed the look of our dear Pig Hoof boys. Instead of the common aluminum enclosure, we will now provide you with a custom made, sturdy metal enclosure, which is silk-printed by hand. For the same price, you get a smarter look, a steel, old-fashioned battery door on the bottom side, and removable rubber feet – so if you want to stick Velcro on the bottom, you simply unscrew the feet. I really want to buy a pig hoof pedal but just can’t wait the 10 months for the pedal to arrive. A lot can happen in 10 months. What would be your second choice after the pig hoof?? I hope some day they can find a way to produce their pedals faster. I think the long waiting time is killing their sales. Thanks Bjorn! One more time, nice review and cool playning! This pedal is awesome, I really considering place an order, but I also like Wren and Cuff the Crapid, if you had the chance of try both pedals, whats is the principal diferences in between of these pedals. Which, do you think it could be better for small amps in bedroom settings and in Stage? On the other hand The are a waiting list of 9 moths to have PIG HOOF, do you think does it worth? Saw this review and ordered a pig hoof. Had to wait a while, but worth every minute, this is a fabulous pedal, iron fist in a velvet glove, screaming sustain and controllable sweetness. Good for so much more than just Gilmour tones, was playing Crosstown traffic on it and fits the role perfectly, so warm, but can be brutal too if you want. Lovely, just what I was looking for, thanks for the fabulous review, would never have found one otherwise. I own a Peavey Vypyr 15 as I ran out of money after i’ve bought my guitar…sadly. I forgot to mention that I’m mostly looking for a Big Muff that can get me as close as I can to Dave’s sound from the DSOTM- Final Cut era, and after hearing the Pig Hoof’s sound I was pretty sure that was what I was looking for. As for the Musket, I’m not really sure where could I get it from since I live in Europe. Shipping from the States is not an option because of the custom fees and frankly the customs in general :) It would have been easier for me to buy the Pig Hoof as there are no customs to care about but I’d like you to tell me if there’s any way my value amp and this beast of a pedal can work together well. I want to buy some guitar pedals for Christmas to finally start my pedalboard. I’d like to buy a Big Muff, and I’ve noticed that you’re a big fan of the Pig Hoof. Would you recommend buying a Pig Hoof if I am using a digital 15 watt amplifier ? If so, should i get the red version or the yellow version? I’m probably going to buy a RAT II pedal for my other distorsion needs, maybe a BOSS BD-2 for a booster too. If you think it’s a bit too much for a bedroom setup, could you give me some alternatives? Hey Bjorn, no broken vertebrae. Four mildly herniated discs, and one of the screws from the previous surgery tried to come out of my back, from the inside, but most of that has healed already, and I should have no lasting issues from the fall. The pedal purchases shall resume very soon!!! I figured you’d see this first, but email me if you get a chance. Peace Bro’ I’m so relieved!!!! Got Stuart Castledine building a Super Fuzz for my Townsend tones, and he’s got a couple limited run things on the way, but it’s not my place to talk about them, but if you haven’t heard yet, you will! Take care, Keith, THE POSTECUTIONER! How does the Pig Hoofs circuit compare to the dead silent circuit of the BYOC Large Beaver? I’m looking for a Rams Head style muff that doesn’t raise the noise floor of my setup. Awesome review by the way! I have been using the Pig Hoof live now for a couple of months, it is a great pedal and covers 90% of gilmour related muff tones. The low end is controlable but it maybe has a little too much gain when used in anger. 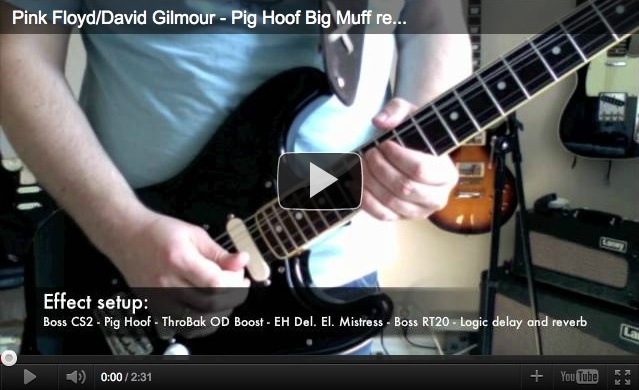 I urge anybody who wants authentic Gilmour muff tone to get a Hoof! I’m thinking of buying this pedal, but I need your opinion first :) How well it would go with my rig: Fender 62’reissue stratocaster (CS 69 pups)->Throbak Overdrive boost->Whirlwind Orange Box-> EHX 90’s Deluxe Mistress-> Boss RE-20->Peavey Classic 30. I have yet to try the Pig Hoof. But I highly recommend the Basic Audio Tri/Ram if you have not already. Everyone who has tried it raves about it and I’ve never read one complaint. I’ve tried many muffs and it tops them all. And double right on the Klon, the PH into the Klon REALLY brought the midrange forward to fat and vocal, just a fantastic combo. What do you think of a Timmy or Klon after a Muff? I have Texas Specials in my Fender USA Strat, the LP has 57 Classic & Classic Plus, My Music Man has well, you know. LOL Dimarzio pups. The shipping on the Large Beaver is $15 from Canada to the US what would the Pig Hoof shipping cost? Dothan, Alabama 36301 USA?? The Pig Hoof sounds good, so does the BYOC Large Muff and the Big Musket. So hard to choose from. I want to get the Gilmour tones as well as the older Black Sabbath tone as well. Which of those Three would give me what I want? Have you tried the EO Banana Boost? Thoughts on it? I love the cover ,and I thought that sense my last post Iâ€™ve saved up abit for sovtek muff but i dicidid i mit get this instead and its cheaper to , Its also past u with flying colors , it also sounds good with the cub stake my new amp:].so that bring me to my next question sense my boss bd-2 craped out on me a copel of weeks ago .Iâ€™m in the market for a booster and I heard about the Electronic Orange Banana boost .A clone of the color sound power boost, it also refers on their site to David and the eclipse days. So Iâ€™m not shear if its jest a stunt to move product or is it the real thing and is it a good buy. Hi, Bjorn, have you had a chance to try out the SUF civil war pedal yet. The clips I have seen of this pedal have been awsome. The SUF civil war pedal sounds great. If you had to choose one original and one clone pedal which ones would you choose? Maybe the sovtek green triangle and the pigs hoof. Have you tried any other pedals recently that would cause you to change your top three clone list? Finally got my Pig Hoof and tried for 1st time today… WOW!! I could play this thing all day. Sound is amazing. Yes, I do agree with you on the fact that the overall sound is determined mainly also depending on the rig one’s using. I have a custom strat with ssl5 bridge & lace sensor gold p’ups / ebony board. It’s a very decent sounding axe & I’ve spent quite a bit of time & effort to make it suit my taste. Currently playing through a Vox hybrid modelling amp which is fairly good sound wise, but looking to invest into a decent tube amp at some stage. Is it true that people are saying that apparently the PH sounds very close to a violet Ram, possibly the best sounding & coveted Ram of all? Too bad that the waiting time for the PH is around 6 months now, though as you’ve pointed out its worth the wait :-). Is it a good pedal for home/practice use as well & combines well not only with pure tube amps? Right now, i’m probably thinking to get myself a Tri spec Large Beaver & see how I go in the meantime while I decide to order the PH. Btw, I’m waiting to receive a truly superb pedal IMHO – the Lunar Module Deluxe from Skreddy :-). It absolutely nails the earlier Gilmour sounds especially DSOTM! Have you ever had the chance to try it? Highly recommended & a very versatile pedal! Will be keeping on track with my PH & muff quest in the meantime. Thanks a bunch once again for your kind help & advice Bjorn! I am in need of some helpful advice as I’m a bit stuck in the crossroads in choosing between a few pedals, one obviously being the PH. I was just about ready to fork out funds for a Royal Beaver, since I’ve read & heard so many good things about it & also for the mere fact that it promises to be an awesome Muff modelling pedal :-). So how well does the PH compare to the RB? Do you personally prefer it against the other, especially for certain songs? Do you have it full-time on your pedalboard? I’m only asking this because it seems to me that there’s this never ending dilemma/mystery debating what is the one ultimate muff version that Gilmour’s sounds were originating from. I know that it could mainly be narrowed down to either the Tri/Ram/Sovtek CW , but all in all I’m sure you’d agree that there’s a fine line between all of these… I of course am going only by what I read & heard so far but if this pedal is really that good in terms of nailing pretty much all of David’s tones post ’76, then it would make sense to get this instead. Btw, the RB costs almost $150 more than the PH, so there’s that to consider as well. I do know that tone is a very personal thing to each of us, that’s why it can be confusing when making these decisions :-/. I do appreciate your help & your advice would be most helpful! I was even gonna hunt for a good used Civil War or Sovtek Green muff, or even just a Tri/Ram BYOC pedal. That’s strange… I thought the previous comment did’nt went trough…Delete that last message! Any how, Desperately waiting for my Pig Hoof! By the way, How is your Baby Daughter? This is a question for anyone. How long to get your order confirmed once you submit it? The date for new pedals keeps getting pushed back so it looks like they’re getting swamped. Just got my PH from electric orange. WOW… This pedal is awesome. I had to wait 3 months for this baby and all I can say to any one who is on the fence – it’s well worth it. As you say, its very loud but to my ear sounds totally authentic. I was looking for a 70’s muff that was Rams head like, and this is it or me. it gets its official airing next weekend. Jan is very helpful and answered all my questions. The pedal was ready early than Jan predicted so defo recommended. excellent article for the big muff’s by the way.. So if you had to pick one between Musket and Pig Hoof as you were going to be dropped on an island.. which would you say. I can’t try either of these locally although I’m sure either would do. Whaddaya think? Hi Bjorn! Beautiful sound! Maybe the best sounding Muff clone sample I heard on video actually. Too bad there’s a 5 months waiting list to get one :/ Do you think a BYOC Large Beaver Ram’s Head would get close to the Pig Hoof? Or would you recommend me another model maybe? Many thanks! It’s a Fender Frontman 212R, transistor, 2-12″ 8 Ohm 50 Watt Speakers. The amp is loud as hell. I’ve got a Mexican Stratocaster with standard pickups, I’m still thinking about which overdrive should I get, as for the rest I’m gonna get the regular E.Mistress, Dynacomp, Moonvibe and Phase 90, and the Nova Delay by T.C. Electronics. Thank you very much for your work, and congrats for the site: it’s simply amazing the research job you’ve done to get every information possible about which effects/guitars/amps David has been using troughout the years. I have just received mine 3 days ago and i’m so glad !!! It sound really floydish with an incredible sustain, i use it with compressor and chorus and it’s just wonderful … A big big thank to Jan who respect the delay of delivery (the pedal was ready to ship the exact day that he predicted) and also for the disposability for answering all my questions. Definitely a good place to spend money for great vintage material !!! Thank also to Bjorn for this splendid review ! Just one question, i’m actually using a boss BD2 as boost for the pig hoof and i would like to know the right setting (pig hoof and BD2) in order to boost the muff without removing the characteristic warm and smooth sound of this wonderful pedal. (i’m using a les paul with burstbucker pro, i know, it’s not the perfect guitar for gilmour sound, i’m saving money in order to buy my first strat !!!). That sounded great! Mother might be my favorite solo. I know how to play the original, but is there a chance you could tab the extended live solo? Also, have you ever heard John Wetton and Adrian Belew’s version of Mother from the Back Against The Wall tribute album? Adrian plays an extended solo with some awesome King Crimson type delay/volume swells. Just received my Pig Hoof from the Czech Republic! I couldn’t wait to get home and plug it in. WOW! Ridiculously amazing sound. I also have the Throbak Overdrive Boost. These two pedals are a match made in heaven! BTW… Thanks for all the great reviews and for the amazing videos, Bjorn. I really enjoy checking in at Gilmourish.com and visiting your Facebook page too. Great stuff!!! Love the site Bjorn,really interesting,Just got a Pig Hoof also,it is fantastic,just awesome when backed up with a second pedal(booster) cheers to Jan! My PIG HOOF arrived last week and i really love how it sounds. I can’t describe it better than Bjorn did in his excelent review (as usual) but i can say than Jan from Electronic Orange is a very nice and honest guy. The pedal was finished at the time he predicted (actually a couple days before), it is very well build, very well finished and it sounds awsome. Have been lerarning a lot from you. Thanks for your great work on this amazing website. I noticed that there’s a les paul hanging on the wall… what model do you use? Mate!!! you are missing the gear review of daveÂ´s final album of the 90Â´s…RUN DEVIL RUN..i know is Paul project but is davidÂ´s guitar what made that album so special!!!! My immediate response was really creamy, I liked it a lot. I listened again and again Cheers. THX Bjorn It sounds nice but a bit to smooth I think. Maybe it is the combi with the DG 20 pick ups. The mistress sounds awesome! I’m jealous. Great review as usual. I’ve been waiting for it for about a year. I’ve been looking at this muff since you’ve done the review of the Electronic Orange Moon Vibe (about a year ago). The only problem was that there wasn’t any review, youtube video or sound clip of the pedal to have an idea of how it sounds. Then a couple of weeks ago i could finally hear one of your sound clips on which you’ve used this pedal (youÂ´ve posted it in another gilmour related forum). Then i email you and ask your opinion about the pedal and you kindly reply me as usual and said that this was a very good pedal and highly recomendable and that you will soon make a review of it. Now, after i saw your review i finally placed an order for a Pig Hoof and i’m sure it was worth waiting. I have a SUF Violet Ram’s Head and I really love it. I’d say it’s inbetween the Triangle BYOC and the 73. If you want to give that one a try I recommend it highly. Wow, I agree with one of the previous posters, the best muff IÂ´ve ever heard. Well, at least to MY ears. Very very smooth as heard in the dry version, I need one!!! Thanks Bjorn for the review!!! PS: nice playing and sound, as usual, you nailed it! the Thames are still listed on their site, but I just found that I cannot access the web store with Firefox. Safari works good. Looking at Kit Raes Web site i have a latter version 3 Big Muff with the AC marking on top with the on/off switch(how advanced we were back then). I paid about 23 pounds for it about 76/77 which seems correct. It was a lot of money as i earnt 14 pounds p/w as an apprentice. I also had a Coloursound fuzz/wah pedal that was crap but i now wish i had kept it. The clip sounds great Bjorn! I’m glad to read about your opinions about the ’73 SUF Muff, sad too. I was thinking about the Stomped Under Foot’s Ram’s Head until I hear it’s wild and boomy. So now I’m thinking it’s going to be either the Tri-Muff or the Civil War. Do you have any experience with either of those models. Thanks for any advise and for having my favorite website. Wow, that was a great sounding muff! Your Live “Mother” solo was great also, the second clip (the one with the processing) definitely nailed the sound! So, are you planing to do any guest appearances with Roger this year!? HAHA! To my ears, this is the best muff pedal. I want one. Great review Bjorn, the soundclip is incredible. Keep it up! Your work is superb. actually to be honest after reading some peoples reviews on the diffrence between the tri and rams head im a little mixed up. Seems alot of people say vice versa on their tones. ive read that the tri has more gain while the ram has less and that the tri is brighter then the ram and then i read another page and someone is saying the complete opposite. but i think ill go with BYOC’s tri beaver. lol I got ya. not trying to aruge i swear, but the byoc was the one you described at being the brighter more sustaining muff and rams head being more dark and agressive, on the muff guide page lol. dont matter of course, eaither one produces perfect Gilmour tones so its dosent even matter. Shine On! Nice review and cool playning! I have a question about your Weber C12GB (Thames) 80W speaker. I can’t find it at the official Weber site. Where did you buy it? Do they still make them? Would the Weber Blue Dog sound the same? again, sounds really good. but what really blew my mind was the second part of the clip. how’d you set the throbak and the mistress to achieve that sound? Love the wet clip……..which has left me with a bit of a problem. I don’t yet have a mistress (electric that is ;-) ) and have been looking at getting an original vintage job yet this cllip sounds pretty bloody good to me….i need some advice my man.. please PM if you have the time. Yeah, wild and boomy describe the 73 quite well. It’s very untame, I haven’t had a chance to crank it up yet so I’m guessing it will smooth out a litte in that situation. Kit’s clips of his one sound great, and I know he plays very loud through a Fender Twin. On a side note, have you tried out the Coloursound Powerboost clone that EO make? Still searching for that new overdrive… it could be an option.. Very reasonably priced. Just wanted to say that Jan from Electric Orange is a very nice guy to deal with! Specially if you are from Europe, check out his stuff, cuz it really is a good alternative to some U.S. gear and you don’t have the hassle with the customs. Nice playing btw… as always! correct me if im wrong bjorn, but ive seen you say numerous times on here that the triangle is the bright version and the ram’s head is the dark sounding version??? The pedal sounds real nice and wonderfully played. I have been playing the 80/81 live wall cd in my car lately so real nice to hear you play the solo from ‘Mother’. I modded it to run off the 9v adaptor but think it sounded better with batteries which it ate at an alarming rate…ha ha..
You could have done snowy’s job with Roger and been far more convincing.obviously i would be doing DK’s part..lol.. I was considering the Pig Hoof when in search for a Rams Head style muff. I ended up with a SUF 73. I think the 73 has to be played loud to get “the tone”. The Pig Hoof seems to handle lower volumes much better. Similar to my Byoc Triangle but not quite, from what I hear. I take it you were inspired by Roger’s show and have been listening to the original recently? hehe.